MSF's project pilot involved a range of activities that included improving infrastructure in five regional health facilities, providing a back-up supply of essential drugs and supplies, distributing basic first aid kits, and more. 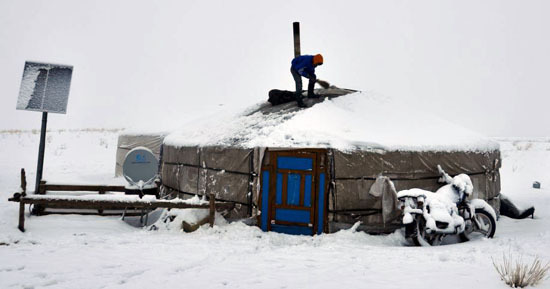 A nomadic herder shovels snow of the roof of his home as winter arrives in Uvs. Last year, Mongolia was hit by a devastating dzud, an extremely harsh winter that follows a very dry summer. Facing heavy snowfalls and temperatures as low as -40 to -50C, large parts of the rural population were unable to access any form of health care. Hospitals and clinics were damaged, infant mortality rose significantly, and the government declared a national emergency. Once the snow had melted in late spring, Doctors Without Borders/Médecins Sans Frontières (MSF) responded by sending an exploration team, an effort that turned into a recently-completed pilot project to help the population in one of the hardest-hit provinces prepare for the winter ahead. The project took place in Uvs, a province in northwestern Mongolia where around 70 percent of the province's 80,000 people were affected by the dzud, and it ran from September to the early November. “Last year’s dzud compromised maternal and neonatal health, and in addition, heating systems in health facilities were broken due to heavy use and some local hospitals partially closed,” said MSF’s Head of Mission in Mongolia Christian Ferrier. During the summer, the province is a three-day cross-country drive from the capital, Ulan Bator. But during the long winter, when the rolling grasslands are covered in deep snow from November through April, Uvs is accessibly mainly by plane. Most people in the province are nomadic herders who live in small groups of isolated, collapsible tents called gers and who make a living raising goats, sheep, horses, camels, cows, and yaks. During last year’s dzud, a high percentage of livestock was wiped out, rendering many herders destitute, and, as a result, more vulnerable to illness this winter. A community-based medical officer assists in the distribution of first aid kits and leaflets. Five counties in the province were targeted for the project. They were chosen because of their distance from the provincial capital and because there had been high levels of mortality during the dzud for children under the age of five. The project pilot involved a range of activities that included improving infrastructure in five regional health facilities, providing a back-up supply of essential drugs and supplies in provincial and county hospitals, distributing basic first aid kits to 3,000 herder families, repairing electricity supply systems, and giving refresher training and drugs to 16 community-based medical officers. “The local level medical officers had varying levels of education and age,” said Dr Mark Stover, the medical coordinator of the project. "Some were in their 60s, but some were in their early 20s, but they were all very enthusiastic and studious. In the trainings we focused on helping the medical officers recognize medical emergencies, and we tried to cover the illnesses that we were told were most common in the winter." 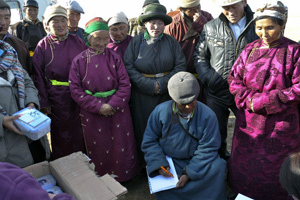 Giving basic first aid kits to the herder population posed a logistical challenge, because many people live in isolated gers and have no access to mobile phones or landlines. “In the end, the bush telegraph worked well," said Ferrier. "Word of mouth about our distributions was how the information was spread." The harsh winter has now begun in Mongolia. In the spring, an MSF team will return to evaluate the project and to see if it helped prepare people for the dzud. In the meantime, MSF is looking into starting projects in Ulan Bator focused on tuberculosis and the health needs of thousands of families who fled the countryside because of the dzud and now live in ger shanty settlements on the capital's fringes.